Get the ultimate PMP® Exam Simulator and earn 10% OFF NOW! - Only short time left! you are here: :Home - Discount Offer, PMP, PMP Exam Simulator, PMP Exam Tips - Get the ultimate PMP® Exam Simulator and earn 10% OFF NOW! – Only short time left! Exclusive Offer - only this Month, act now! : Get the most popular PM Exam Simulator at a 10% discount! - Only short time left! Best-selling product that has helped thousands of Project Management Professional (PMP)® aspirants pass the PMP® exam – The PM Exam Simulator ! Yes, the final release of The PM Exam Simulator for the Project Management Professional (PMP)® questions is here! That release increases the total number of questions from 1200 to 1600 questions. 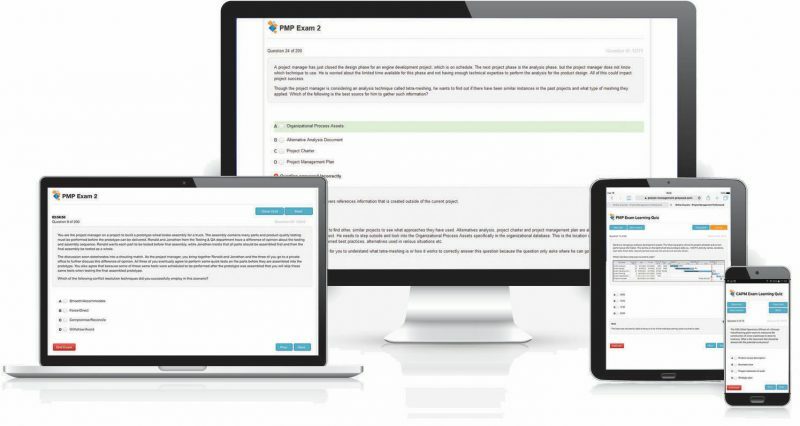 Students can now access seven premium 200-question PMP® exams like the real exam for their studies, as well as a 200-question ITTO exam. All questions are based on the PMP Examination Content Outline as well as A Guide to The Project Management Body of Knowledge (PMBOK® Guide) Sixth Edition. ​Access countdown only starts when you take the first exam! Practice exams on your preferred device. Anytime. Anywhere. We have conducted a PMP EXAM prep guidance program for all new PMP aspirants (so, People like you, i guess 😉 ). This program works like your very own, well structured and feature-rich PMP Exam study plan! You do not need to create a study plan on your own. Instead, trust on the experience of hundreds and thousands of already being PMPs. What will be New in the 6th Edition of the PMBOK Guide®? What are the Impacts on PMP Aspirants? ​What about Updated PMP Exam Prep Materials? ​What if I've already Got MY PMP Certificate? ​In addition we have commented all the facts based on our yearlong experiences (just Updated!). And of course you can ask your own questions within the comments section and we will do our best to answer them to your satisfaction. And may be we will add your question also to our Q&A collection!